The Diary of W. Hill during the Great European War. May 18: Enlisted in the Royal Field Artillery for 6 years with the colours and 6 years Reserve. May 20: Underwent training at Maryhill Barracks Glasgow, Scotland, in the 31st Battery, as a driver. Was only 15 years of age. Training at the above place. July 3: Was drafted to Woolwich to finish off training, and be equipped for France. Sept 23: Entrained and reached Southampton docks with a draft for France, and set sail. Sept 24: Reached France, and sent to the base at Le Havre. Sept 25: Entrained for firing line to join the 48th Brigade Ammunition Column, 14th Division, in action at Ypres. Made lead driver for supplying the guns with ammunition – had some narrow escapes. Still in action at Ypres. Jan 12: The division shifted to the left of Ypres to a place called Elver Dinghe – nothing worth mentioning occurred here. March 23: British front extended 14th Division and some others relieved the French of the Arras front after a march of 7 days from Elverdinghe via Amiens. Went into action on the right of the Arras road, about 200 yards before entering Arras. Still in action, on Arras front. Some guns shifted into Arras and the other side about June. Went laying wires in new position – 6 of us. Narrow spueak whilst on this job, 2 wounded by rifle fire. Aug 20: Division sent to the Somme area. Guns at Mametz wood and Montauban. Very hot work to do here while offensive was on. Kept with the Division at this place till Sept 23. Went from Northampton to Ipswich and stayed there. Went to Salisbury plain – Larkhill Camp – on firing course and returned to Ipswich. Went to Maningtree on miniature battle stunt. Went to Woodbridge on miniature battle stunt. The exercise book is a (London City Council) school book, covering his spelling tests and essays from 5-11-1913 through to 10-2-1914. His marks through this time are consistently 10/10, except for 19-11-1913 when he only achieved 9.5. The sketches are brilliant and show a scientific approach to subjects: the writing is admirably clear. The book obviously leaves a gap between the last entry on 10 February 1914, and his enlisting, on 18 May 1915. This book has no significance or relevance other than a piece of history: it was bought on Ebay in 2013. 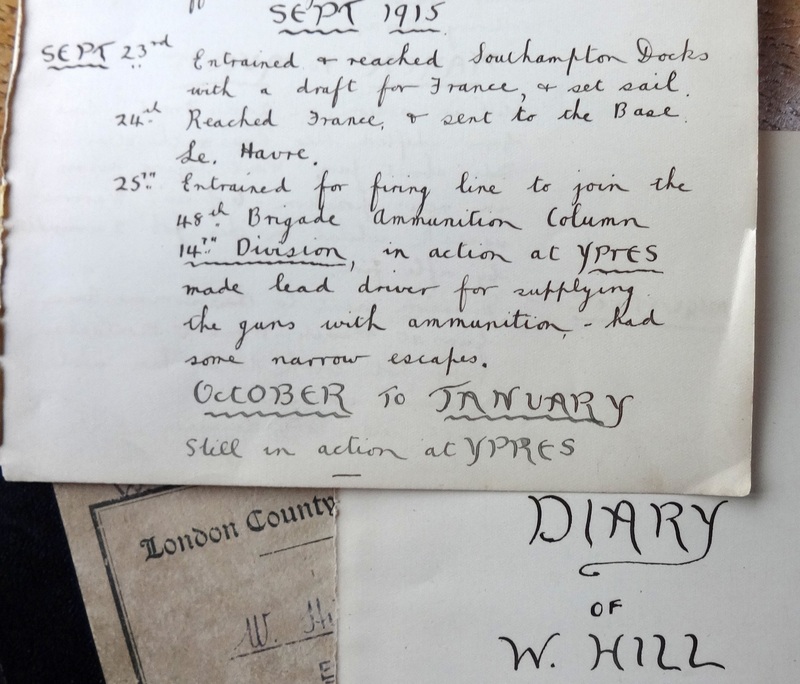 These diary pages will be on display in the Alresford Museum cabinet in the Alresford Library as from May 2014.